Retirement News > Reverse Mortgages > Articles > Calculating a Reverse Mortgage: What is it and How Does It Work? A reverse mortgage is a federally insured loan for homeowners who are 62 years of age and older. On this page you’ll find lots of information about reverse mortgages and a link to our reverse mortgage calculator. Why Isn’t My Reverse Mortgage Loan Amount Equal to the Full Value of My Home? The amount of money you can get with a reverse mortgage varies greatly from person to person. Variables include your age, property value and mortgage balance. These all play a role in determining how much of your home value you will be able to access. But only a lender will be able to give you an exact dollar amount using current interest rates and program fees, as well as the appraised value of your home. Before you try to estimate your reverse mortgage loan amount, let’s review how the calculation works. Each of these programs will yield different amounts of money. Using this information, the lender will indicate what percent of your home value can be borrowed. Because HECM Reverse Mortgages are Federally insured, there is a maximum property value that can be mortgaged. As of 2019, the limit on HECM Reverse Mortgages is $726,525. This means that even if your home is worth more, the amount that you qualify for will be a percent of the maximum amount. Proprietary “jumbo” loan options do not use this limit. There are two main reasons that your loan amount may be less than you think it should be. Despite popular belief, you still own your home even after taking out an RM. Home ownership means that you will keep at least some of your home equity stake. There is no way to borrow the full value of your home while still keeping the title in your name. An advantage of retaining equity in your home is that it gives you more flexibility for your future. At some point down the road, you might decide that you want to move into something smaller or move to a new area. You will still have the option to sell the house. Once your home sells, you can use the proceeds to pay the balance of your Reverse Mortgage loan. Then you can use the remaining home equity to finance your relocation. Your heirs will also still have the first rites to your home should you live in this home until you have passed away. They’ll need to refinance if they want to keep your home to use as a primary residence or another purpose. Otherwise, they can sell the house and use that money to pay what you owe on the RM. They can keep any money that remains. A reverse mortgage can be the only loan on your home. As a result, the first function of the RM is to pay off any existing liens on your property. Do you still have a balance due on your mortgage or another type of home loan? If so, part of your RM loan must be used to pay off that existing balance. Assume you are 65 and own a $300,000 home with $50,000 left to pay off on an existing mortgage. You might qualify for a reverse mortgage loan of around $120,000 (after deducting all closing fees). Yet, that does not mean that you immediately get access to $120,000. The RM company will first cut a check to your current mortgage holder. This will pay off your existing mortgage. This happens first and foremost so you do not have the option to bypass that to access the full $120,000. This will give you the HUGE benefit of eliminating your monthly mortgage payments. Which in turn improves your monthly cash flow. Bear in mind that property taxes and homeowners insurance are still your responsibility. Conventional mortgages or lines of credit can give you access to a higher percentage of the home’s value. But there are two MAJOR trade-offs between a conventional loan vs. a Reverse Mortgage. A RM does not require you to make monthly payments toward the loan. But a conventional loan most certainly would. Now, for those people who are concerned with maintaining equity in their homes, not to worry. Not being obligated to make monthly mortgage payments is not the same as saying that you can’t. If you’re interested in trying to keep the interest down and the equity up, you CAN make a payment toward a Reverse Mortgage. You can pay as much as you want to pay, whenever you want to pay it. There is no penalty for paying down a RM. There are a couple of things you ARE obligated to do. But they are things that you are most likely doing already anyway. The other major difference between an RM and other types of home loans is the term. As long as you continue to live in your home, keep up with the taxes, insurance, and maintenance, the loan will not become due. The loan will become due once you (and your spouse if you have one) have left this property for good. If you’re still living when the house is sold, you’ll keep the remaining home equity after the RM is paid off. Should you live there until you’ve passed away, your heirs can either sell or refinance. Currently, there is only one widely available RM. It is the Federally insured Home Equity Conversion (HECM) reverse mortgage. a. To pay off an existing mortgage. b. Be taken as upfront cash. Because you are accumulating interest on the full loan amount from day one of the loan, a fixed interest rate will be offered. The adjustable-rate HECM reverse mortgage enables you to use your loan in two ways. a. To pay off your existing mortgage. b. And/Or take all remaining loan proceeds as either a line of credit or annualized monthly lifetime payments. There are many advantages to taking your loan amount as a line of credit or monthly lifetime payments. a. With a line of credit, you only pay interest on the funds you withdraw, not the total amount that is available to you. b. Another nice feature of the line of credit is that it will grow over time as well, giving you access to more each year. In addition to the loans above, there is the HECM for Purchase program. HECM for Purchase enables you to use an RM to buy a home to be used as your new primary residence. This program lets seniors combine the benefits of downsizing with those of a reverse mortgage. They also can eliminate their mortgage debt and find a home that is more practical for them. Imagine that you are living in a $400,000 property on which you still have a $100,000 mortgage balance. If you sold your current property, you would walk away with roughly $300,000 in your pocket. If you were downsizing to a $200,000 home, with a HECM for Purchase you would only need to put approximately $100,000 down on the purchase of your new home. Now, not only are you now in a home that is more suitable for you, but you still have $200,000 in the bank and no monthly mortgage payments! Several lending companies offer proprietary loan programs, mainly for higher value homes. These include high value condos that are not FHA-approved for a HECM. Let’s say you are 70 years old and your home is worth $1,250,000 and you have a mortgage balance of $400,000. With the HECM program, you may only be able to borrow $300,000 – not enough to pay off the mortgage. Unless you have savings to pay off the difference, the HECM is not an option. With a jumbo loan, you may be able to access the full mortgage balance. This allows you to eliminate monthly mortgage payments and improve your cash flow. The terms for these proprietary solutions vary by company. And you’ll find that several new products are being introduced soon. You can call us at 1-866-759-2559 to see if you can be matched to a proprietary product lender. They can review all available options with you. Depending on your situation, you may have some options for how to receive your RM proceeds. An RM lender could help you design a program to meet your unique needs. For an official estimate, contact a reverse mortgage lender by completing our information request form. As stated above, if you owe anything on your home, an RM must be used to pay off your existing mortgage. This is a key benefit since it eliminates your traditional monthly mortgage payments. The HECM Fixed Rate reverse mortgage enables eligible homeowners to take out some cash. This can be done in a lump sum, from their home equity. This cash can be used for ANY purpose. Although you don’t make a monthly payment, interest charges accrue on the total loan amount. This occurs every month you carry the reverse mortgage. As a result, the total size of your loan will increase over time. Though the total amount owed can never exceed the value of your home. When a person inherits a home that has an RM on it, there is no financial obligation on that person to do anything at all with the home. If there is still equity beyond what is owed on the RM, it would, of course, be to their benefit to sell the house. Afterward they can pay off whatever is owed to the RM company, and then keep the remaining equity. If there is little to no benefit in selling the house based on what is owed, they can simply remove any of your personal belongings they want and walk away. If nothing is done with the home in a certain period of time (the lenders decide this period), the RM company will take over on the property. They will sell it themselves and make their money back that way, at no detriment to the heirs. Opting to receive monthly income from a reverse mortgage is similar to purchasing an annuity. You can usually opt for the “Tenure” or lifetime option for the monthly income. However, some lenders can also offer “term” options. A term option means that you will receive monthly income for a predetermined amount of time. With the term option, you would likely receive a larger amount of money each month than you would receive with a lifetime or tenure option. Remember that the longer that you choose to disperse the money, the lower the monthly amount will be. To determine what income you could receive with a term option, contact a lender. A credit line is money that you have available for use on anything at any time. A credit line differs from the cash option. With a credit line you only accrue interest on the money that you use, not on the amount available to you. A credit line is the most popular and in most cases the most cost-efficient option for receiving a RM loan. This is because you choose how much money to take and when you want it. Interest is only paid on the costs of the loan and the amount you’ve taken out while the balance available continues to grow. Many people use this option not because they have an immediate need for it, but because they want to have something in place that can be easily accessed in an emergency scenario (sudden medical expenses, unexpected home repairs, etc.). Learn more about the reverse mortgage line of credit option. An RM lender is a great resource to get an accurate reverse mortgage calculations. They can help you design a program to meet your unique needs. For an official estimate, contact a reverse mortgage lender by completing our information request form. 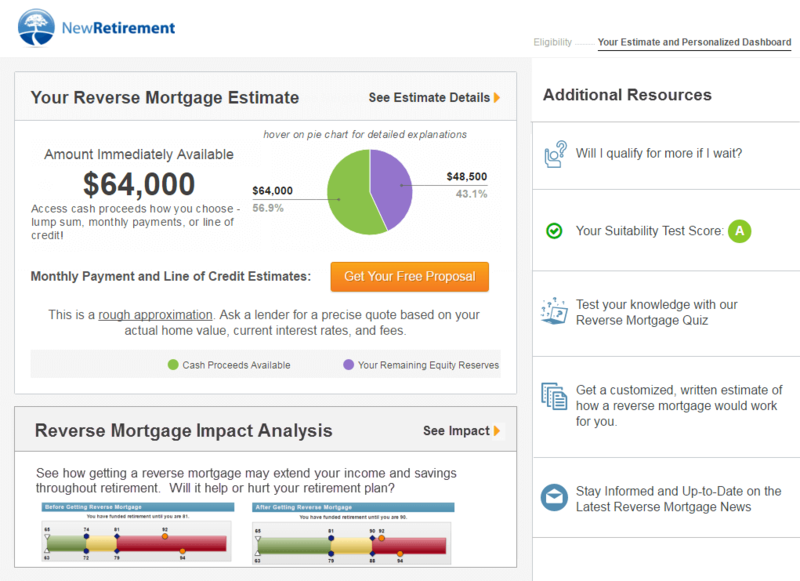 Still have questions about the reverse mortgage calculator? Call us at 866-759-2559.